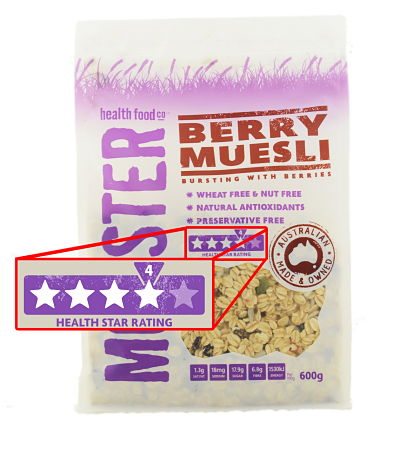 Over the coming weeks you will notice your favourite Monster muesli varieties will have a new addition to their packaging – a Health Star Rating . We are extremely proud to announce that we are the first company to have the Health Star Rating on our packaging. The Health Star Rating was developed by industry,consumer, and public health groups with support from the Australian Department of Health for you – the consumer. The Health Star Rating gives an overall indication of a food’s nutritional quality and provides an overview of the key nutrients within the product – such as salt, fats, sugars and protein and fibre. A product can score anywhere from a half to 5 stars, with 5 stars being healthiest. For the past 21 years we have prided ourselves on being honest and transparent about our ingredients and manufacturing processes. We believe you deserve to know what is in your food and which products are healthier options. The Health Star Rating system will allow you to nutritionally compare products like-for-like, at-a-glance to help make your decision easier. PRESS RELEASE: MONSTER HEALTH FOOD CO.
Sydney, August 21, 2014: For the first time, consumers across Australia will be able to purchase Health Star Rating packaging in the cereal section of Woolworths, as products from Monster Health Food Co. hit the shelves. 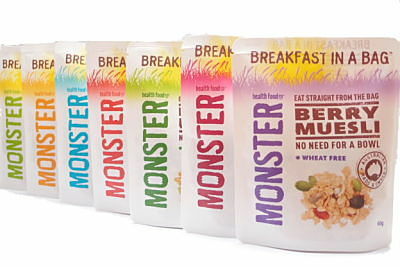 Monster Health Food Co (MHFCo), an Australian-made, family-owned muesli manufacturer, were the first company to implement the system on their products in April 2014. The move was met with an overwhelmingly positive response from consumers and stakeholders alike, and they remain the only company to carry Health Star Ratings on their products, which has today also extended to five flavours. Sydney, April 16, 2014 Monster Health Food Co. (MHFCo. ), anAustralian-made and family-owned breakfast food company, has today launchedAustralia’s first products to display a Health Star Rating on its packaging.The new front-of-pack labelled products will be on supermarket shelves fromthis week. The first two products introduced each have a Health Star Rating of4 out of 5 stars. Monster Health Food Company,an Australian made and family owned breakfast food brand, has today launched anew addition to their already extensive list of muesli products, Breakfast In A Bag. The pre-packaged breakfast bags come in 60-gram single servings, allowing for milk or yoghurt to be poured into package, addressing a nation-wide need for breakfast offerings that are easy to eat, portioned controlled and off the shelf.